If you saw Paris-Nice this year — or even if you only caught the final stage — you’ll know already that it was a suspense-filled, surprising race from start to finish, and it suggests that the grand tours this year, especially the Tour de France, are going to be particularly spectacular events. Let’s take a moment to pore over some of the highlights from this last week of racing. Paris-Nice this year threw us in at the deep end for a week of unexpected triumphs, with Orica-GreenEdge’s Michael Matthews storming to victory in the untechnical 6.1km time trial. We all know that Australia’s bright young thing is certainly not just a talented sprinter; he packs a punch on the uphill finishes, and can haul himself over some of the tougher climbs on the way to stage finales. But very few would have had him down as a likely time trial winner here — even Matthews himself remarked, post-race, that he’d been targeting a top five finish. First step of the podium is a remarkable achievement, especially ahead of riders like Tom Dumoulin (one second down, 2nd place), Geraint Thomas (seven seconds down, 7th), and Richie Porte (eleven seconds, 10th). We must also acknowledge brilliant rides from the New Zealand TT champ Patrick Bevin, who took third step on the podium, and the Movistar duo of Jesús Herrada and Ion Izagirre, in 4th and 5th respectively. It was the beginning of a strong week for Sylvain Chavanel, too, who finished ninth. But perhaps the losers of the day were Alberto Contador and Romain Bardet, who started their week of riding 16 seconds and 25 seconds behind the yellow jersey, respectively. The weather for the first half of the week was harsh, cold, and wet. In other words, a typical European spring. And stage 1 resembled a spring classic in more ways than just weather, with the final 15km circuit featuring muddy, gravelly sections and short sharp climbs, before the final sprint. The horrible conditions would prove too much for some of the riders, and the expected sprint between André Greipel, Marcel Kittel, and Alexander Kristoff was not to be realised. Kristoff finished the best of the three, in 62nd place; he and Greipel suffered on the muddy sections, and Kittel came off worse, looking tired and unwell for much of the race. This all played into the hands of Matthews, who ably defended his yellow jersey on the rougher sections, with good support from Orica through the stage. Matthews finished 5th, losing no time on the G.C., just ahead of the strong classics riders Tom Boonen and Sep Vanmarcke. Direct Energie will be proud of Adrien Petit’s extraordinary ride, and his 4th place finish was well earned. This left us with a podium of three of the more opportunistic sprinters: Cofidis’s Nacer Bouhanni took third, and Sky’s Ben Swift took second. The winner, though, was FDJ’s Arnaud Démare, who nipped out of nowhere to steal the stage for France. It was an excellent bit of work from a rider who has been struggling to live up to his under-23 World Championship 2011 stripes, but who can relax a little now with a tough stage in hand. The stage into Commentry is perhaps destined to be the most talked about finish in this year’s race (though stage 7 poses a strong challenge in that contest). Despite that fact, it featured perhaps 200km of the dullest racing of the year. The gap stuck fast at around four minutes for the longest time, and not much occurred throughout, even on the sole category 3 climb. As the break were reeled in, however, things got serious. First, Pierre-Luc Périchon came a cropper, shooting off the course and hitting a spectator on the run into town. The fan was relatively unscathed, and, though it ended Périchon’s Paris-Nice, he’s apparently making a speedy recovery. Next came the sprint itself. Once again, the super strong sprinters like Kittel and Greipel showed signs of suffering, and were badly placed when the sprint opened. Démare was also pushed back. 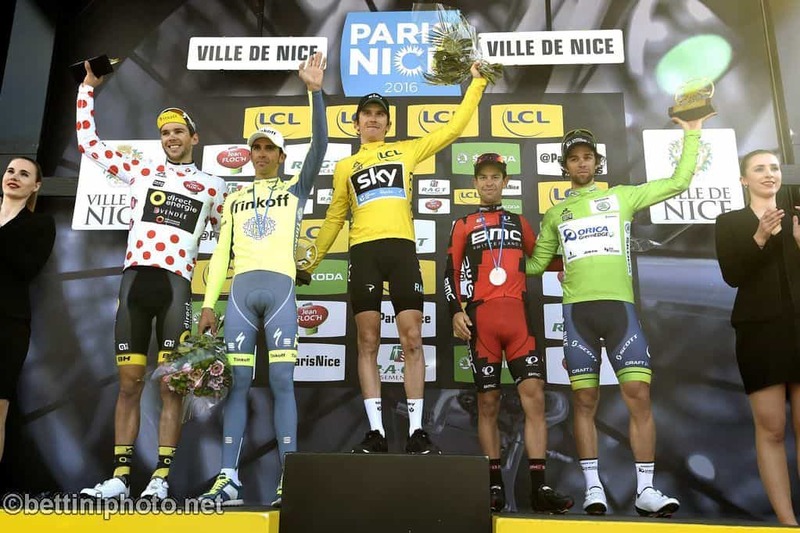 This left the trio of yellow jersey Michael Matthews, Nacer Bouhanni, and Niccolo Bonifazio. As they roared towards the line, it was clearly going to be a head to head between Matthews and Bouhanni, with Matthews swerving his way towards the barriers to nip past Bouhanni. Now, it’s arguable that Matthews’ move was a little risky in itself, as he tried to tunnel his way between the barrier and Bouhanni, but it’s undeniable that he had the pace to take the win in a clean sprint. It wasn’t to be a tidy affair though, and Bouhanni clearly didn’t like Matthews’ move. Bouhanni leaned in in an effort to close the door on Matthews, came into blows with the Australian, and barely managed to stay on his own bike — that Matthews also stayed upright, albeit losing most of his forward momentum in the process, is nothing short of amazing. Bouhanni crossed the line first, and was announced the stage winner, but his short-lived celebrations were drowned out by grumblings en masse from the crowd. The judges got into a huddle, Michael Matthews was duly awarded the stage win, with Bonifazio taking second. Bouhanni was relegated to the same time as the peloton behind, putting him in third on the stage. But many who saw the replays of his attack on Matthews consider him a lucky man to have not been disqualified outright. Fairer weather, but fouler play on stage 3. There were to be no winners in stage 3 of the tour; the stage was cancelled after 93km as blizzards started at the finish on Mont Brouilly. It was a part of a week of poor weather on the Europeans mountains, with a stage in the Tirreno-Adriatico also being annulled. There were, however, still losers on the day, with five strong riders calling it quits: Daniel Teklehaimanot, Fedrigo Pierrick, Arthur Vichot, Alexis Vuillermoz, and Philippe Gilbert. Another flat stage finish, another messy sprint in Paris-Nice 2016. Kittel once more suffered, and was not to feature in the sprint. Kristoff was up there, but seemed to lack the power in the finish; he edged out Matthews for fourth place, but the Orica rider still held on to the yellow. The winner, though, was Nacer Bouhanni, though it was hard to be too pleased about that. At least the former boxer didn’t have to push anyone off their line to take this win. Second on the day was Edward Theuns, who’s been having a great season so far, and third was Greipel — the big German might not be riding at full power at the moment, but he seems to be enjoying better form than either Kristoff or Kittel. On paper you’d have called this one for a sprint, or, failing that, a good shot for a breakaway, with plenty of bumps along the way and a climb up the massive Mont Ventoux in the middle of the stage. But on the day it came down to a solo victory, with Astana’s Alexey Lutsenko leading a diminished peloton by 21 seconds in Salon-de-Provence. Lutsenko’s winning move was made on the final ascent up the Col de Séze, when he bridged across to the remnants of the morning break. Said remnants were greatly fatigued by the journey up and over Ventoux, and Lutsenko had to tackle the last 17km to the line on his own. The Kazakh time trial champion pulled off the feat remarkably well, and, with Démare, he’s our second former under-23 world champion winner of this tour. He was followed a little later by Alexander Kristoff, who’d finally found his legs, and the yellow jersey, Michael Matthews. The queen stage of Paris-Nice, stage 6 was all about the final summit finish. With the early uphill test on stage 3 lost to the bad weather, there was much uncertainty as to who would perform on the final climb, but there was still plenty of expectation regarding Tinkoff’s Alberto Contador. The sprightly Spaniard was now 37 seconds back on the yellow jersey, and some way down on the best placed G.C. rider, Geraint Thomas. Come the final climb, Tinkoff duly put in the work, with Rafal Majka setting a blistering pace for his team leader. It was one of those moments in cycling when a strong peloton becomes just a handful of riders in a matter of 500 metres, and the pressure from Majka meant we were quickly watching just a few key men: Contador, Thomas, as well as Richie Porte, Ilnur Zakarin, Sergio Henao, Simon Yates, Rui Costa, Romain Bardet, and a select few more. Costa made an attack, but Majka calmly annulled it without changing his rhythm, and, as Majka finally peeled away, that set up the expected brutal assault from Contador. Contador always looks twice as tall as everyone else in the mountains, barely in his saddle at all as he throws attack after attack at riders who are all glued to their seats. But Henao diligently worked for Thomas and kept him in contact the whole time, neither of them matching the force of the attacks, but both maintaining a high enough cadence to chase down each kick from Bertie. Soon it was Thomas, Henao, Contador, Porte, and Zakarin left, and, in the final sharp few hundred metres, the attacks were coming from the Tinkoff and BMC riders. As Henao, exhausted, slipped back from the leading four, you’d have had a tough time picking a winner from the leaders, and Ilnur Zakarin might have been your last choice. But, against the odds, only Zakarin could answer as Geraint Thomas made the final attack of the day. Contador lost ground, as did Porte, and the Katusha man fought hard to get around Thomas just in time for the line, in what was a huge win for him. ‘G’ looked a little put out to have lost the stage, but he did, of course, gain the yellow jersey, and he now had 15 seconds in hand on Contador and 20 on Porte. And Zakarin is looking good ahead of this year’s Giro, adding another World Tour win to the stage he took in last year’s edition. We should also note the solid performance from Simon Yates, who was stuck in no-man’s land behind the leading five riders for the last few kilometres. Yates nearly managed to tag back on right before the final moves opened up, and finished the day in 6th. What was clear, coming into the final stage, was that if Alberto Contador wanted to see a reshuffle in the general classification of this year’s Paris-Nice he was going to have to take matters into his own hands. And so, it wasn’t a surprise that Bertie attacked the yellow jersey on one of the climbs — but it was a surprise that it was with over 50km remaining. The stage finish was to come after 15km of descending from Col d’Èze, and that looked like a good springboard for a final attack. But Contador didn’t wait around, going long on the Côte de Peille. The day’s break was falling to pieces already, but, crucially, Tinkoff had managed to get two guys up the road ahead of Contador. That meant that, when he attacked, he had forces ahead waiting to drag him away from Thomas. It was a brilliant tactical play, and, once he’d quickly opened up a minute on the Sky-led peloton, it looked like it was going to work. Down the valley and towards Col d’Èze Sky gave chase, and it was thanks to a huge effort by Nicholas Roche that the gap began to close on the way to the last climb (Roche, no doubt completely exhausted, finished the stage in a large group that came in over 11 minutes down). As they took up the climb, Thomas, looking tired, was back at the tail end of the favourites group, which was tailing Contador as he picked off the last of the break. One of these riders was Tim Wellens, who had been out in front for much of the day, and who didn’t want to give up at this late hour. He stayed with the lead group as it struggled up d’Èze, and managed to follow the key moves. By now, Thomas in the yellow jersey was visibly suffering in the wake of Alberto Contador, who was still animating the race by repeatedly attacking (his last lieutenant, Majka, faded half way up the climb). Henao continued to work for Thomas, but they both began to lose touch of the main group, just as Contador was launching a strong move off the front. Only Richie Porte and (surprisingly!) Wellens could follow, and they crested the climb together. They led a small secondary group down the descent by 15 seconds, with Thomas, Henao, and Tony Gallopin a further 20 seconds down. Somehow, though he had been visibly fading on the way up the climb, Thomas found enough energy and called upon his team pursuit track skills to start pulling the gap back, working well with Henao as well as Gallopin, who didn’t want to lose his top ten on G.C. and the informal ‘best placed Frenchman award’ (however, cynical voices on Twitter are already speculating that a possible move to Sky might also have been what motivated Gallopin’s generous turn-taking). It was nail-biting stuff all the way down, as the yellow jersey group gained ground on the favourites group, who were also clawing back seconds on Contador, Porte, and Wellens. Wellens, meanwhile, had stopped working as hard as he had been, apparently exhausted by his exploits in the day’s break, and, as the Thomas group caught the second group on the road, the swelling favourites group was able to bring Contador back into sight. Coming into the last kilometre, the overall win was still uncertain, and it was going to come down to a handful of seconds either way. As the line came into sight and Contador and Porte kicked off their sprints, it became clear that Tim Wellens had been holding something back. He shot past the G.C. men and stole the win in Nice, the picture of triumphant exhaustion. And then it was a matter of counting down the seconds. One, two, three, four… and the next group on the road crossed the line, five seconds back, led in by Tony Gallopin. Geraint Thomas was looking tired at the back of this select pack, but he’d done what he had to do: he’d won Paris-Nice ahead of Alberto Contador by just four seconds. Richie Porte, meanwhile, finished in a strong third, a further eight seconds back. It was a stunning final stage, one that kept going back and forth between Thomas and Contador, Sky and Tinkoff. Both team leaders showed real strength and fighting spirit, but both also owe huge thanks to their teams. In particular, Sergio Henao and Nicholas Roche deserves medals for their hard work in stages 6 and 7. And let’s not forget Tim Wellens, who managed to keep calm whilst a G.C. battle raged around him, and who managed to craftily take a big stage win thanks to the preoccupations of Porte and Contador. A concise account that does the surprising level of drama of this early season Tour justice. Thanks. Thanks Luke, glad you enjoyed reading it!